A garage door requires several parts and components in order to let it function efficiently. For the health and safety of your home, you must make sure that all your garage parts are working fine. The parts of the working entrance must undergo regular inspection so that the garage door is maintained and functions properly. If you find that any part is faulty, get it replaced immediately as that can hinder the performance of the door. Replacement parts and garage door parts are available in plenty with Garage Pros. We can supply you with every garage door part you are looking for. 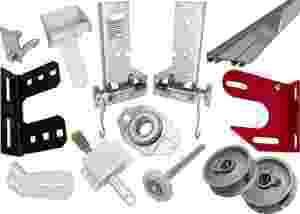 Garage door accessories to enhance the look and appeal of the garage door can also be availed. Garage Pro has a complete line of garage door parts including garage door cables, hinges, springs, rollers, slats, tracks, remotes, seals, drums, springs, couplings, shafts, keypads, etc. Some of the garage door parts may be repaired easily but for some parts you need skilled and efficient technicians. Do not take any chance or meddle with your garage door. For speedy garage door repair and parts replacement services, get in touch with our technicians. It is necessary for your safety and security that you replace the garage door spring from a professional. We have the set of experienced repair professionals who can easily replace any defective part to help you avoid accidental injury. The materials and components of your garage door speak a lot about the functionality of your door. The way you maintain your garage door determines whether you will face any issue or not. Among all the garage door components, springs are the most important. Without the spring, the hatch cannot open. The entryway will lift only when the Torsion Springs function well. If the helical springs break, the door will not open or it will get difficult to open or close the gate. Torsion springs offer the lifting force. From us, you can buy garage door springs and get it installed. Just like the springs, the rollers and tracks are necessary garage door parts. They guide entry hatch when the hatch moves up and down. The small wheels are the rollers that run along the panels while tracks are there to control the rollers. You may get these parts replaced from Garage Pros. When you talk about the garage door components, the panels are the most overlooked parts. There are various long panels joined by the hinges to create the entry hatch. Well, the number of panels depends on the size of entry or opening. Individual panels facilitate proper rolling of the system into an arch. On the other hand, the hinges permit the panel to move independently. So, you may say that hinges and panels are important components for the proper functioning of the garage door. Apart from the above mentioned parts, Garage Pros also has the garage door openers, the garage door opener remotes, the tracks, boards and sections. So, no matter what component you are looking for, we have them all. Just get in touch with us to discuss out your needs.